This week we have a 1913 capsule in California that for some reason contained hair clippings and a tooth; an Andy Warhol capsule that will be opened in Pittsburgh tomorrow; and a TV crew that finally found the long-lost Steve Jobs time capsule in Colorado! 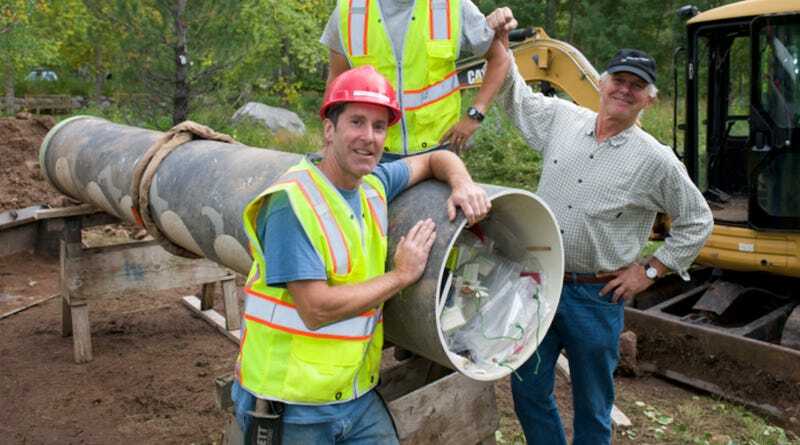 Yesterday the crew from National Geographic Channel's show "Diggers" dug up the elusive Steve Jobs time capsule, originally buried at a 1983 conference in Aspen, Colorado. Time capsule nerds rejoice! The giant 13-foot-long tube has been lost since 2000, when people first started looking for it. Capsule hunters at the turn of the millennium were thrown off by new landscaping in the area which made its exact location difficult to pinpoint. The capsule was filled with what some estimate to be thousands of items from different people at the conference, but the late Apple founder's involvement made it one of the most coveted "lost" capsules in history. In what probably looked like a deleted scene from the Nine Inch Nails video for "Closer," a 1913 time capsule containing hair clippings and a wisdom tooth was recently opened at a Masonic Lodge in California. The hair apparently belonged to someone who went by the initials A.M., and a cryptic note mentioned that she'd "recently been robbed of all her hair." As for the wisdom tooth? That belonged to W.M., initials that probably stand for Worshipful Master, the term for the senior officer at a Masonic Lodge. The capsule also had three bottles filled with wine, corn and oil. According to the San Luis Obispo Tribune, those bottles were included as "a symbolic gesture to reflect Masonic history and its connection to King Solomon." Below you can watch incredibly awkward video of someone struggling to pull the time capsule from its cornerstone hiding place.